Australia Business Directory & Marketplace - Uniform Packages, Product by 911 Supply Inc.
Short or Long sleeve shirt with a pair of Dark Navy Twill Pants, Cargo Pants, Deluxe Cargo Pants or Reflective Cargo Pants. 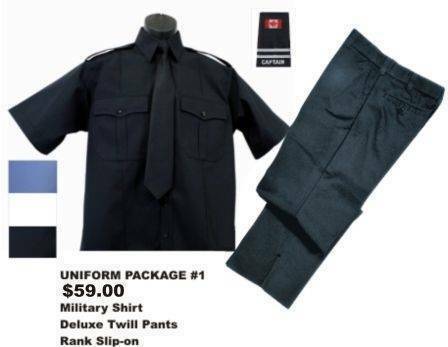 Comes with a Rank Slip-on for your shoulder Epaulette. Packages start at $59.00ea to $79.00ea.